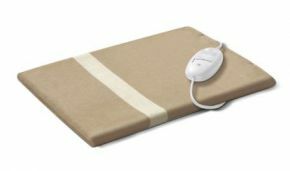 This fleece heated pad can be used to provide gentle warmth and comfort wherever it is most needed- at the feet, underneath an elbow or shoulder, or wherever a little extra warmth would bring relief or ease aches and pains. The heat pad has a removable, washable cover (the pad itself needs to be kept dry) and two levels of heating for maximum effectiveness. Unlike the traditional hot water bottle, which is difficult to fill and goes cold over time, our fleecy heat pad it is safe to use and provides warmth for as long as required. It has a cut-out switch to automatically prevent overheating. Love this product! An excellent purchase. I bought this for use on my back as its ideal to just plug in and use whilst I\'m sitting down, and much safer than a hot water bottle. Different heat settings too which is good.